Growing your own plants from seeds is a great way to save money on gardening. 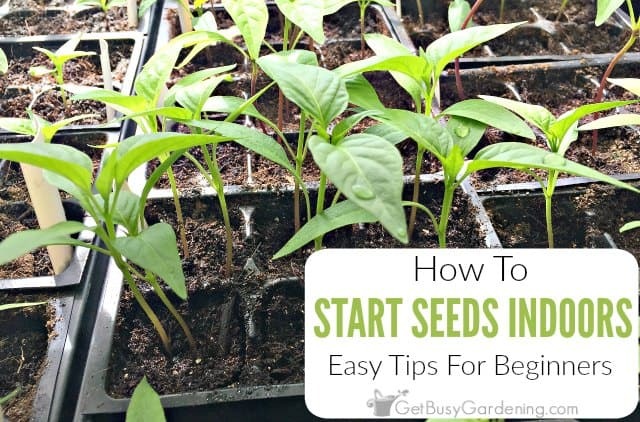 But starting seeds indoors can be tricky and frustrating when you’re a beginner. 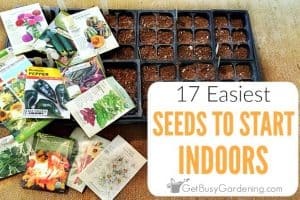 I want it to be fun and easy for everyone, so that’s why I wrote this post with tons of tips for starting seeds indoors for beginners! 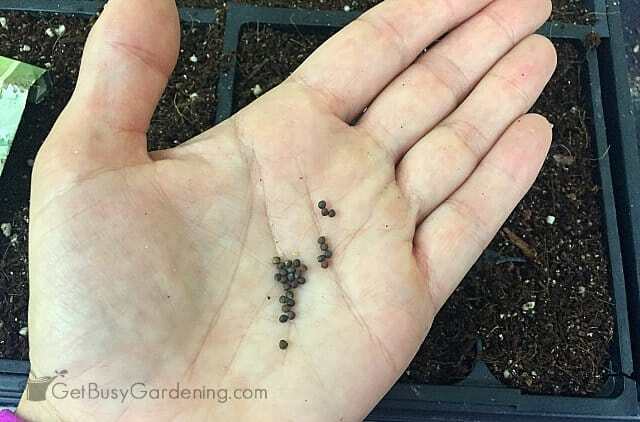 In this post, I’m going to break it down to make it much easier for you, and give you all the basics of starting seeds indoors. You’ll learn everything you need to know to start planting your seeds indoors, and get a jump-start on your gardening season. Generally speaking, you should to start planting seeds indoors six to eight weeks before your average last frost date. 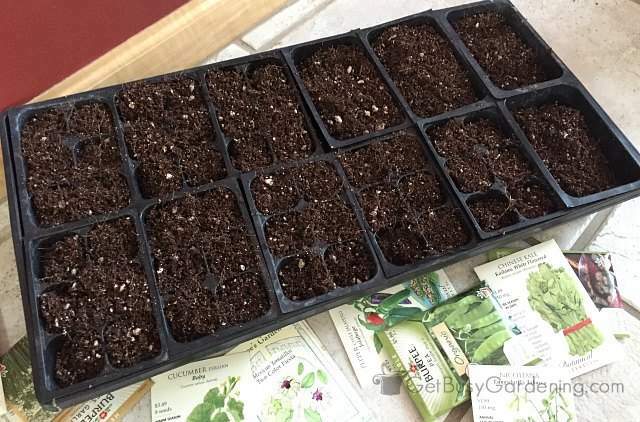 But be sure to read each seed packet to figure out when to plant seeds indoors, it should tell you the recommended indoor seed starting dates for each type of seed you want to grow. From there, you can make a list of all the seeds that need to be started around the same time, and begin by planting the ones that require the longest time to grow first. Getting the timing right is one of the biggest struggles for new gardeners. It may take a little bit of trial and error in the beginning, but don’t worry, you’ll get the hang of it. Learn more about When To Start Seeds Indoors. You don’t need to buy a ton of expensive indoor seed starting supplies and equipment, but you will need to purchase a few things. Besides seeds, the main essentials are seed planting trays, and a high-quality seedling soil mix or peat pellets. In addition to these essentials, you might also need buy seed starting grow lights, a heat mat, and some fertilizer. I’ll talk about each of these types of supplies in detail next, so you can figure out exactly what you’ll need to get started. 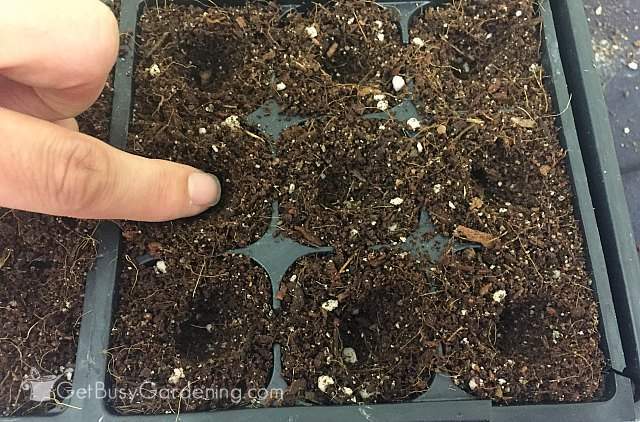 If you’re a beginner, I recommend using plastic seed starting trays, or buying some kind of a seed starting kit (like this peat pellet kit). Using containers that are specifically designed for growing seeds indoors like these will make it much easier for you. If you already have seedling trays that you’re planning on reusing, it’s crucial to clean and disinfect them first. Disinfecting seed trays will help prevent seedling blight (a fungus that causes seedlings to die off at the base), which is a common problem when starting seeds indoors. 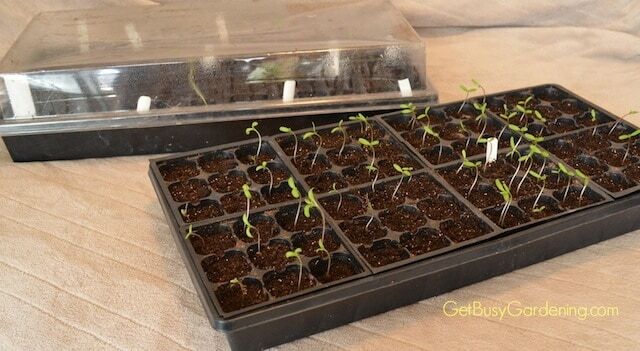 Learn exactly how to clean and disinfect your seedling trays. Whatever you do, don’t cut costs when it comes to the soil you use for starting seeds indoors, the quality of the soil is very important when starting seeds. Quality soil will help with the germination of seeds, and give your seedlings a healthy start in life. Using the wrong type of soil can keep seeds from growing, or cause other problems down the line. The best soil for seed germination is a light soilless mix that is both fast draining and also holds moisture. 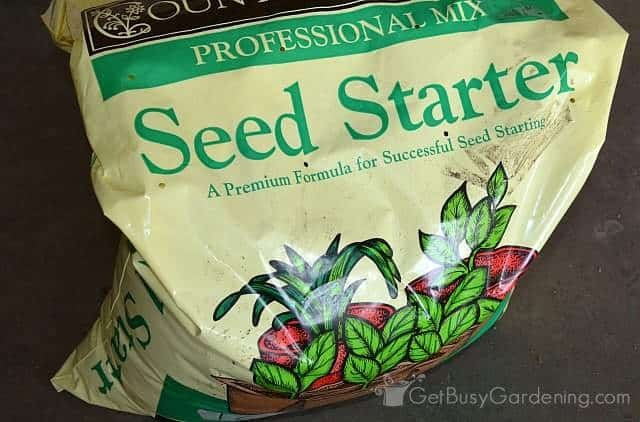 It’s best to buy a potting mix that is specifically made for starting seeds, like this organic seed starting mix. 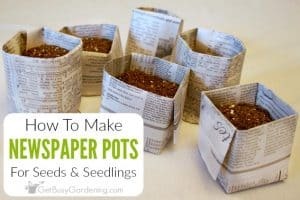 You can also make your own DIY seed starting medium using a mix of coco coir or peat moss, perlite and vermiculite, or you can use seed starting peat pellets instead of soil if you prefer. Learn How To Make Your Own DIY Seed Starting Mix (With Recipe!). Adding bottom heat under your seed trays helps speed up the germination of seeds, which means your seeds will sprout much faster. Indoor seed starting heat mats can usually be purchased at a local nursery, or you can buy a seedling heat mat online. 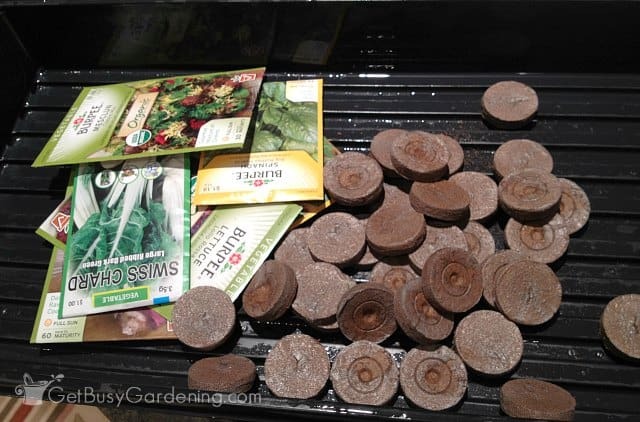 Don’t worry, you don’t need to buy a heat mat for every single seed tray you plant, you can rotate them as the seeds start growing. Once the seeds have germinated in one tray, move the heat mat under a different tray to speed up the germination of those seeds next. 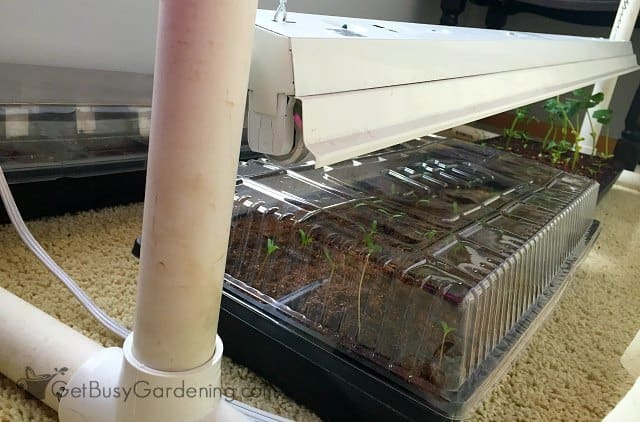 You could also put your seed trays on top of a radiator or heat vent instead of using a heat mat (as long as it’s not too hot). Just make sure to keep a close eye on the moisture level of the soil; heat sources like this can dry out the soil much quicker (heat mats will not dry out the soil faster). A south facing window is the ideal spot for starting seeds. But, if you don’t have a south facing window, find the warmest room in your house. 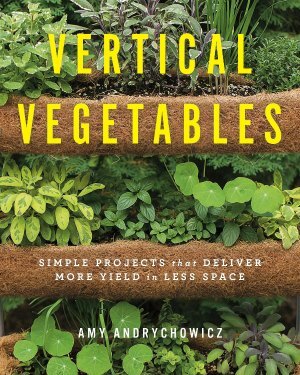 Warmth triggers the seeds that it’s time to start growing, and seedlings will grow better in a warmer room -vs- a cold room. But really, as long as you have the proper equipment, you can start seeds in any room of your house, even in a cool and dark basement. If you want to grow seeds in a dark closet or cool basement, then grab some grow lights, a heat mat, and a space heater. Easy peasy. It’s difficult to grow strong, healthy seedlings indoors without the proper amount of light. While a south facing window is the ideal location for indoor seed starting, it won’t provide enough light for most seedlings. Starting seeds indoors under lights really is the best way to grow strong seedlings. You can get a grow light system for starting seeds, or you can make your own using a fluorescent shop light fixture and grow light bulbs. Seedlings need between 14-16 hours of light every day to grow their best, so I recommend getting an inexpensive outlet timer to make it a snap to give your seedlings the perfect amount of light. You don’t need to use fertilizer until after your seedlings have grown their first true leaves. Once that starts to happen, then fertilize them with a weak dose of organic liquid fertilizer. I recommend using a natural, organic fertilizer on your seedlings (especially for vegetable seedlings) rather than synthetic chemical fertilizers because they work better and are healthier for us. For most seeds, you don’t have to do anything special to prepare them for planting. Some seeds will germinate better if you soak them overnight though. Also, seeds with a hard seed coat will germinate better when you nick the coat before you plant them. 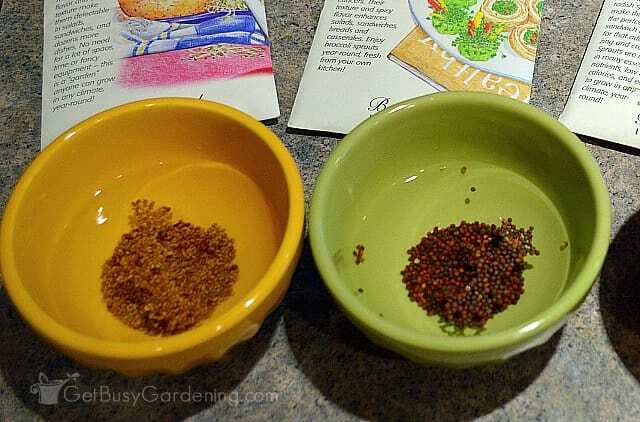 Read the seed packets to see if either of these steps are necessary, or if there’s any special seed preparation for planting the types of seeds you want to grow. Before you start planting your seeds, read the seed packets to make sure there aren’t any special growing requirements for the types of seeds you want to grow. The general rule for planting seeds is to plant a seed twice as deep as the seed is wide. Teeny-tiny seeds can just be sprinkled over the top of the soil. Once you’re done with that, planting the seeds is easy! Step 1: Loosely fill your seed tray with seed starting mix (or soak your peat pellets to get them ready for planting). Step 2: Make a hole in the soil first, or gently press the seed into the soil to the correct planting depth. Step 3: Cover each seed with soil, and then gently pack it down to ensure that the soil comes in contact with the seed. Step 4: Water your seeds by pouring water into the seed trays (pouring water over the top could displace your seeds). Starting seeds indoors is not only fun, but it’s a great way to get a jump-start on the growing season. 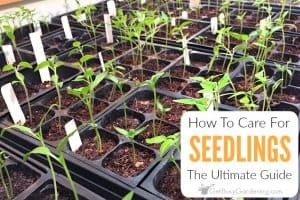 When you grow seeds rather than buying plants from the garden center, it can literally save you hundreds of dollars every spring. Plus nothing is more satisfying than being able to grow seeds for your garden. 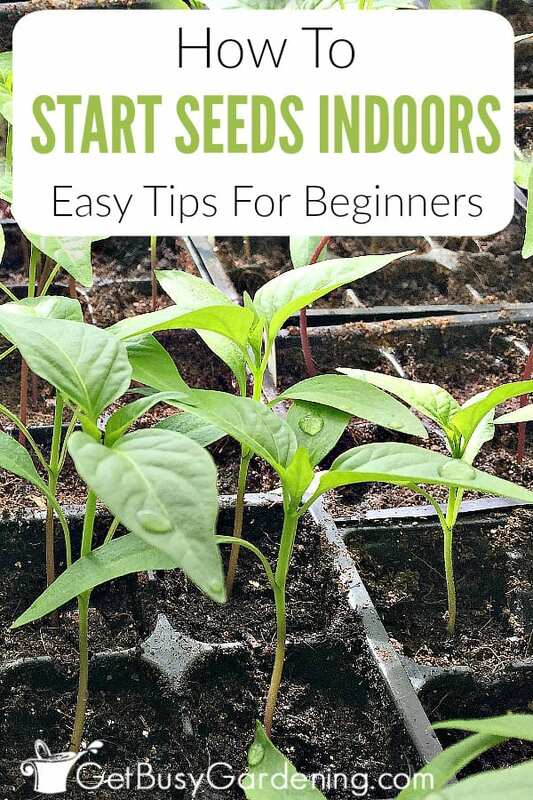 If you need more help getting started with indoor seed sowing, then my Starting Seeds Indoors eBook would be perfect for you! It’s a quick-start guide to starting seeds indoor, and it will get you up and running in no time! Download your copy today! 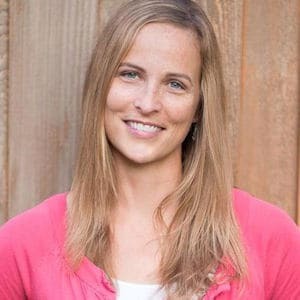 If you want more and you’d like to learn everything you need to know about how to start seeds for your garden step-by-step, then check out my Seed Starting Course. It’s an online seed starting training program that will teach you everything you need in order to grow your own seeds, and I created it specifically for beginners. Don’t waste another year struggling to learn how to grow you own seeds! Enroll in the course and get started today! Share your tips for starting seeds indoors in the comments section below. Thanks for the helpful tips! I am getting ready to start seeds. Every year it sneaks up on me and I am late to the game. 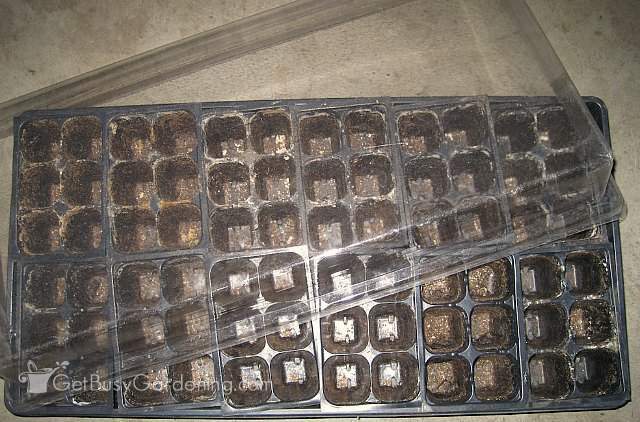 You can take the cover off the seedling tray once all of the seeds have started to sprout, or once some of the seedlings are starting to touch the plastic top. Thank you for the tips. I started some seeds indoors, but once I moved them outside – they didn’t last long. Hopefully my new batch will do better. 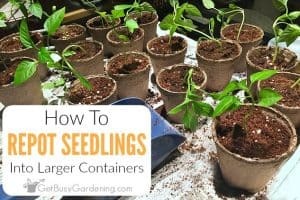 Did you harden your seedlings off properly when you moved them outdoors? 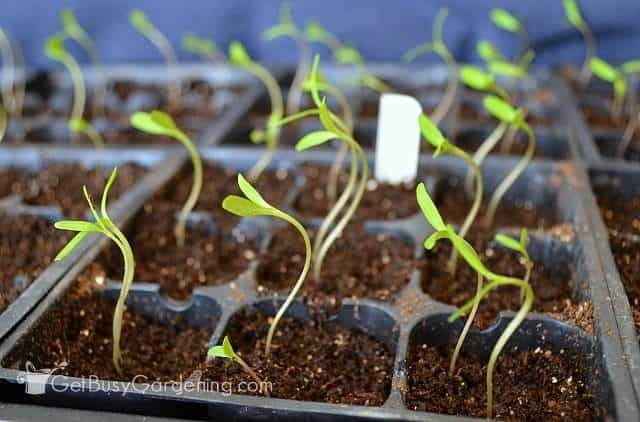 How To Harden Off Seedlings Skipping that step is the biggest mistake that newbies make when starting seeds indoors. I hope your next batch will do better too! Good luck. I like to recycle … and I don’t have a ‘lid’ per say for my plants…any recommendations or ideas? Plastic jugs cut in half or something? I currently use saran wrap and toothpick or pencils to hold it up (lol) Don’t judge me. Oh my gosh, the saran wrap with toothpicks is perfect to cover your seed trays! I’ve used that trick myself. 😉 I like to use plastic containers that have a lid to start my seeds too, like the ones you get when you buy salad greens or deli/baking goods from the grocery store. Those work great too! First year growing plants from seeds. I have to grow them emim the basement. We do have windows but it is cool. Heat mats are under each tray. Do you recommend keeping heat mTs under the plants once they germinate? Loved your advice!! You can remove the heat mats once the seeds have germinated. If you’re worried about the basement being too cool, then you could leave the heat mats, or you could add a space heater. The grow lights will also help to provide a small amount of warmth for the seedlings. My seedlings are “leggy”. Now it looks like hairy white stuff on top of the soil. Where did I go wrong? I used seed starting soil and even bought a grow lamp with red and blue lighting. The white stuff on top of the soil sounds like mold growth to me. If so, don’t panic, it’s pretty easy to get rid of, here’s how to get rid of and prevent mold growth in your seed trays. As for the leggy seedlings, that means that they aren’t getting enough light. Make sure your lights are hanging right over the top of the seedlings, only a couple inches above them. Then move them up as the seedlings grow taller. Also, make sure your lights stay on for 14-16 hours a day. Here’s some detailed information about grow lights for seedlings. I started my seeds in the button type planter ball.the seeds have grown to abour 1.5 inches with leaves. when do I put them in a bigger container before planting them outdoors in a raised bed? You can pot up your seedlings once they have grown to be about twice as tall as the height of the seedling trays. Here’s more information about caring for seedlings, including details on when and how to pot them up. I used to start my seeds indoors and had them germinate, transplanted them and continued growing them in my greenhouse about mid-April without any problems. The last two years, I have followed the same routine as before but my seedlings have died off from what appears to be “fruit flies” that are in the starter mix. Is it possible that these flies are in the mix when I buy them in February? Maybe the bags have sat in a warehouse over winter. Wondering if I would have more success making my own starter mix. Any suggestions. Those aren’t fruit flies, they are fungus gnats. They may have come in the bags of soil you bought from the store, but really, they can come from anywhere. Here’s information about them… How to Get Rid of Fungus Gnats However, it’s very rare for fungus gnats to kill seedlings. I am worried that perhaps your seedling trays are infected with seedling blight, and your seedlings are dying from damping off rather than the fungus gnats. Here’s a post about how to disinfect seedling trays, and it explains more about seedling blight and damping off.